1878 $1 Morgan Silver Dollar, 7 Tail Feathers, Reverse of 1878, PCGS MS-63, Brilliant Uncirculated. Wow! This is great looking white and flashy coin, with a bit of light rim toning. 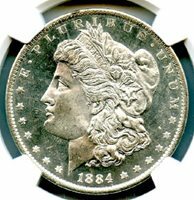 Very attractive Morgan Dollar, and at a great price. Write for higher quality scan or layaway options. Zero problems guaranteed. Free Shipping. 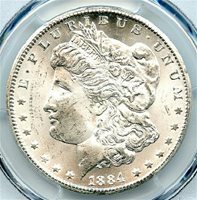 1880-S $1 Morgan Dollar, PCGS MS-66+ ("plus" designation), Brilliant Uncirculated. Wow! This is very flashy coin, strong strike, with attractive light gold rim toning and great cartwheel luster. 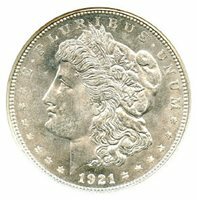 Very attractive high-end Morgan Dollar, and at a great price. Write for higher quality scan, layaway options. Zero problems guaranteed. Free Shipping. 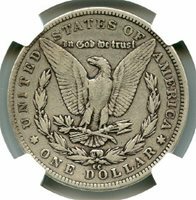 1884-O $1 Morgan Dollar, NGC MS-65 Deep Mirror Proof Like. Wow! This is an absolutely blast white blazer -- a real monster coin. It looks MUCH better than the pictures. Very attractive Morgan DMPL Dollar, and at a great price. Write for higher quality scan or layaway options. Zero problems guaranteed. Free Shipping. 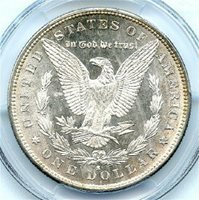 1885-CC $1 Morgan Dollar, PCGS MS-63, Brilliant Uncirculated. Wow! This is an absolutely blast white blazer with great cartwheel luster -- a very frosty coin. Very attractive CC Dollar, and at a great price. Write for higher quality scan or layaway options. Zero problems guaranteed. Free Shipping. 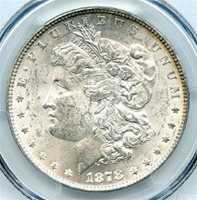 1895-O Morgan Dollar, NGC AU-55. My, oh my! Talk about "just so close." This coin sells for $14,000+ in MS-60, and $7000 in AU-58. Here's a very nice AU-55 for much less. All white coin, strong strike, nice flash still remains -- zero problems guaranteed. Write for higher quality scan or layaway options. Free Shipping. 1880-S $1 Morgan Dollar, NGC MS-67 CAC, Brilliant Uncirculated. Double wow! This is an absolutely blast white blazer, with great mirrors -- a monster coin. CAC certified as above average for the grade. A common date in uncommon condition. Write for layaway options. Zero problems guaranteed. Free Shipping. 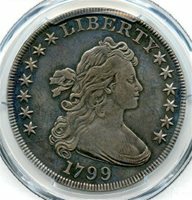 1799 $1 Draped Bust Liberty Dollar, PCGS VF-30. This is a really nice and all original coin with darker blue toning. Very attractive Early Dollar, and at a great price. Write for higher quality scan or layaway options. Zero problems guaranteed. Free Shipping. 1884-CC Morgan Dollar, PCGS MS-65. Brilliant Uncirculated. Wow! This is an absolutely blast white blazer -- a real monster coin. Very attractive CC Dollar, and at a great price. Write for higher quality scan or layaway options. Zero problems guaranteed. Free Shipping. 1886 Morgan Dollar, NGC MS-67. Brilliant Uncirculated. Wow! Brilliant Uncirculated. Double wow! This is an absolutely blast white blazer -- a real monster PQ coin. 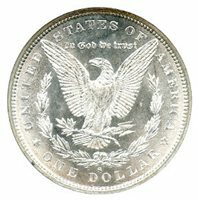 A common date in uncommon condition -- very attractive Morgan Dollar. Write for higher quality scan or layaway options. Zero problems guaranteed. Free Shipping. 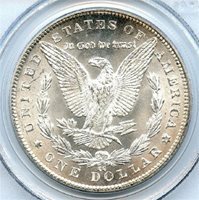 1891-CC $1 Morgan Dollar, PCGS MS-63, Brilliant Uncirculated. Wow! This is a wonderful looking all white beauty. This coin has a very light and attractive golden rim toning; Very attractive CC Dollar, and at a great price. Write for higher quality scan or layaway options. Zero problems guaranteed. Free Shipping. 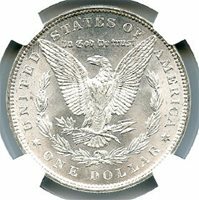 1921-D $1 Morgan Dollar, NGC MS-65. Wow! This is an all white coin with great cartwheel luster. The 1921 Morgan's tend to be "flat" -- this coin is NOT flat. Attractive 1921 Morgan's are tough to find in MS-65. Write for higher quality scan or layaway options. Zero problems guaranteed. Free Shipping. 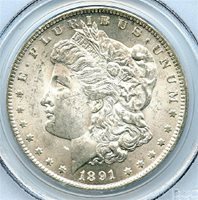 1889-CC Morgan Dollar, NGC VF-35. Nice looking and high end Key Date. All original coin -- properly graded and guaranteed genuine. Very attractive CC Dollar, and at a great price. Write for higher quality scan or layaway options. Zero problems guaranteed. Free Shipping.